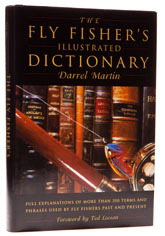 Dictionaries of fly fishing aren’t the sort of thing that bounce into your lap every day, and I had to think hard to come up with much competition for this one. Both McCully’s Dictionary of Fly-fishing and McLane’s Standard Fishing Encyclopaedia are out of print, so I think Martin is probably the only game in town right now if you want to look up what a diapause is, are troubled with too much seston, or suffer a broken gildard. There are many historical terms in the book, which may not please everyone, and there is an inevitable American bias (you will look for “Waddington” in vain), but on the whole the book is a resounding success. My chief criticism is that the dictionary is a bit dear – roughly five pence a definition, by my reckoning, but the Lyons Press should be congratulated on publishing it. Let's see an expanded second edition.